The Vice-Rector for Internationalisation during the last session where participants presented their projects. 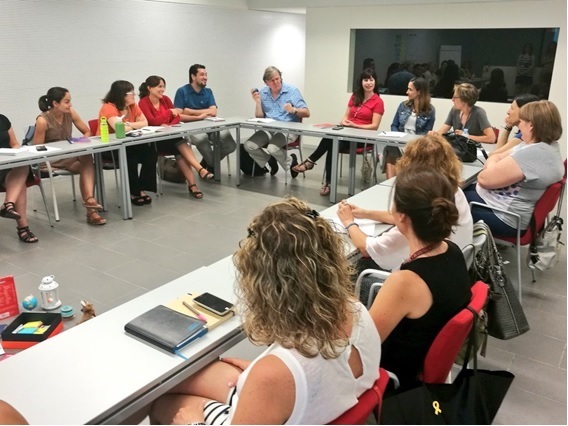 “La Internacionalització, cosa de tots” is the course that aims to empower administrative staff by providing them with knowledge and skills related to the URV’s internationalisation process and follows the overall objective of the SUCTI project (Systemic University Changes Towards Internationalisation) which is to transform the internal mindset of universities and enable them to become truly internationalised institutions. The course was taught in three all-day sessions on 2, 4 and 9 July, by 3 URV staff members: Inés Acebes, from the Human Resources unit, Montse Martínez, from the Language Service, and Núria Golobardes, from the International Center, who were all selected by the university management last April to be trained as trainers during an intensive weeklong training session at the Adam Mickiewicz University in Poznan (Poland). According to the comments from the more than 20 participants, the training course has increased their awareness of internationalisation and deepened their commitment to this aspect of their work. The projects presented by them on integrating an international perspective into their current jobs show that they are really engaged and motivated. One of the factors behind the course’s success was its methodology, which was dynamic and reflexive and worked from the bottom-up by encouraging contributions from all the participants. The level of success was also reflected by very high activity on social media during the course, like the SUCTI Twitter profile. 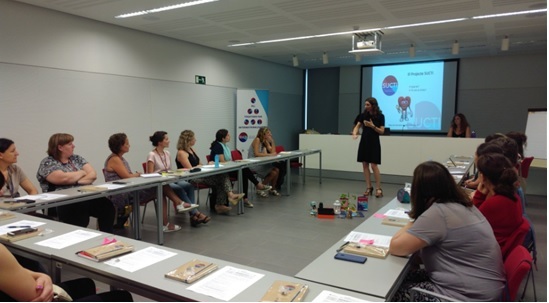 The Head of the International Center, Marina Casals, welcoming the participants and explaining the SUCTI project. In addition, other URV staff members were invited to describe their mobility experiences: Monica Bonillo, from the CRAI, spent a week at a German library, and Pablo Montero, from the Bureau for the Study and Analysis of Information, took the opportunity offered by the INU international network to do staff shadowing at Kingston University in the United Kingdom. Colleagues from other URV units involved in internationalisation also came to explain their everyday work, including Marina Vives, responsible for staff mobility at the International Center, Rebeca Tomás, who works also at the International Center and is part of its strategic team, Cinta Sanz, administrative technician of the WINTOUR Erasmus Mundus Master’s Degree and Inés Solé, from the Centre for Development Cooperation “URV Solidària”. The Vice-Rector for Internationalisation was present at the final session during which the course participants presented their internationalisation projects. This gave participants the chance to be heard by the leadership of our institution and the Vice-Rector the chance to learn about all the good ideas and projects that different staff members and units have about internationalisation.